LLoyd Jensen 2012-2013 President and I swapping banners! What an adventure I had this morning. I was going to speak at the Rotary Club of Brisbane Planetarium but did not arrive in the most conventional of ways. I always use Translink to map my way around the city but on this particular morning, the bus dropped me off in a super busy intersection and I had no idea where to go as cars were zooming past me right and left. My bus driver had told me to start back-tracking which did not make sense so I tried to call my Rotary contact but he had left his phone at home so I had to figure out how I was going to make it to my presentation on time. I started looking around to see if there was anyone I could ask. Thankfully, this nice man explained that I had to follow the bikers along this footpath that would lead me to a pedestrian bridge that would take me to the other side of the road. I still wasn’t sure if I was going in the right direction. Then the footpath ended and I was just walking along the side of the road and would occasionally meet eyes with a construction worker who gave me an odd look. I just kept walking forward and in another five minutes, I saw the Brisbane Planetarium sign! Thank goodness for the sign or I would have been lost a lot longer. I made it to the meeting right on time and everyone kept commenting on how cold my hands were! Thankfully cold hands didn’t affect my presentation and I had a great time speaking to the club. 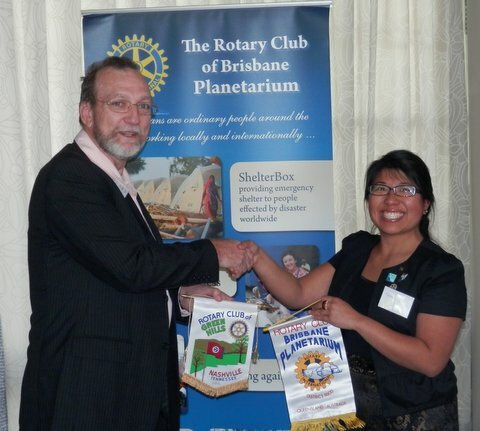 The Rotary Club of Brisbane Planetarium was actually the first breakfast club in Queensland and accepted by Rotary International on November 26, 1985 and then by District 9600 on December 5, 1985. They meet every Thursday morning for breakfast at the Botanical Cafe in Mt-Cootha Botanical Gardens at 7am for a 7:30am start. 2012-2013 President Jensen described the club as renegade that has a progressive vision. They have founded three new Rotary Clubs and two Probus Clubs. In addition, they inducted the first female member of Rotary in Queensland in 1989 and one of their female presidents went on to be the first female District Governor of District 9600. The incoming 2013-2014 President of the Club will be Carol Wells. The club is very active and has an exchange student who attends weekly meetings like at Pine Rivers. Their changeover meeting was coming soon so they were trying to confirm numbers to thank President Lloyd for his great job and welcome President Carol. They extended an invitation to me but unfortunately, I would be overseas. One of their members lives in Moorooka and her neighbor is Japanese so hopefully we’ll be able to meet one another after I return from the holidays. This is my last presentation in Brisbane until I return from the holiday break. Each visit is different and I really appreciate being able to see the diversity within Rotary but how they can still work together and achieve so much.